While all of the Atelier titles have you playing as a protagonist that specializes in alchemy, this title sees you playing as Nelke von Lestamm, a scholar and aristocrat that wants to help continue the family business of town development and management. She travels with her maid and bodyguard Misty who aids in fighting any monsters they may come across, and also is big on emotional support for Nelke since she frequently finds herself flustered from all of the work she has to do since she’s mostly going in blind. After receiving her first work order from her father, she finds herself in the town of Vestabalt. The town isn’t exactly run down or anything, but it could definitely use some uplifting and gentrification. 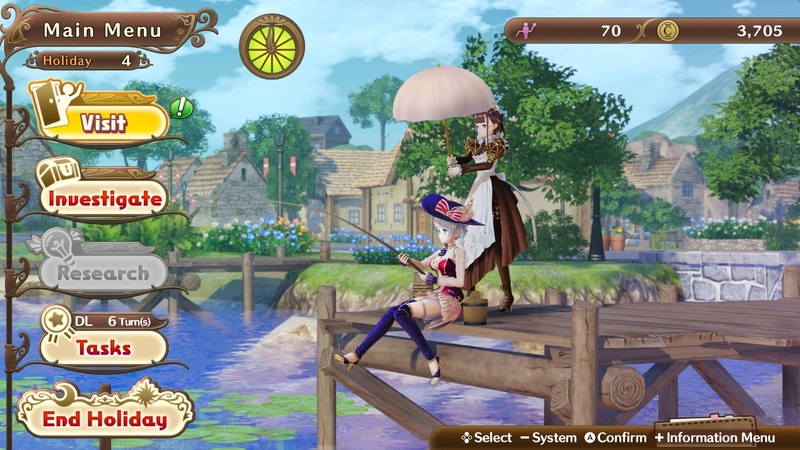 The great thing about the Atelier titles is that, while they have some dark undertones from time to time, they’re mostly feel-good RPGs that are filled with the most vibrant of colors, smiles, and adventures. 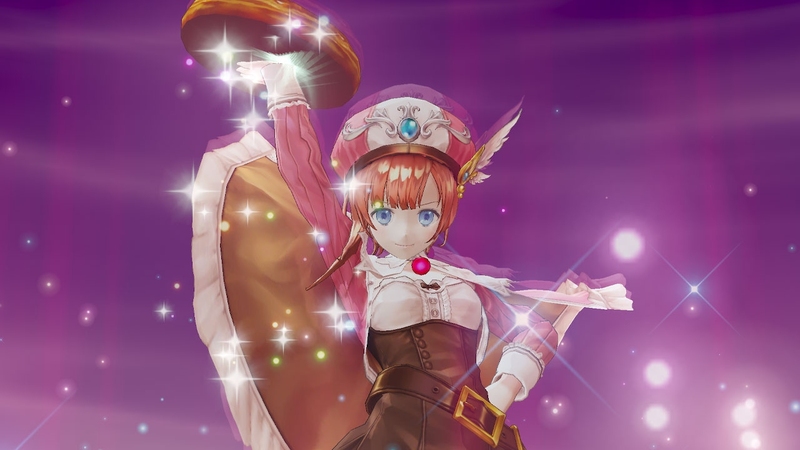 This continues here with Nelke & the Legendary Alchemists, but the gameplay portion – whenever you do actually get to play it – is so lacking and frustrating that I found myself flummoxed, especially with tutorials and boxes still popping up hours among hours later. I understand wanting to be immersed – and God knows Atelier does a great job at getting you invested in all of the likable characters of the series – but I wasn’t notified that I, too, had to be a scholar and an aristocrat. Nelke is naive and quirky, but she’s still just as likable as all of the other characters in the series. Since she herself doesn’t do alchemy, she tries to find others to bring on board in hopes that they would help the town thrive and be as successful as possible. It’s great seeing twenty plus years of characters come together, but all of their introductions are so anti-climactic that it doesn’t make any of them seem particularly special. Also, because we never got the first few Atelier entries when it debuted, we’re seeing some of these characters for the first time. That’s neat, but with the way they’re introduced, I also feel like we’re meant to already know how each’s personality and special attributes are meant to be. With 40 characters crossing over and returning for the ultimate meet up, it’s a treat to see, and the inclusion of some new characters are nice as well, but it can get a little overwhelming keeping up with them all, especially since it also includes side series like the Mana Khemia games. In addition to the typical city-building stuff you do in Nelke that comes fully fleshed out with profit and loss margins, weekly reports, and every other kind of documentation you would typically see in running a real life business minus stocks, you can increase relationship with tons of characters in the game to get on better terms with townsfolk and raise relationship statuses to get better abilities and upgrades with all of the agriculture and production you do in the game. Gaining relationships with residents and increasing your Friendship Levels leads to special events and cutscenes with them that also lead to story events, but a lot of characters are random NPCs that don’t lead to anything significant other than hidden artwork and unlockables like skins, models, soundtracks, and a few others. It’s good for those going for 100% completion, but ultimately it has no real impact on the game. If anyone has worked retail or run a business of their own, there is an honest-to-god profit and loss margin you’re expected to keep up with, alongside weekly reports of how sales are going relative to previous weeks, and current trends with plenty of graphs that show exactly how business and structure is shaping up. It is absolutely wild to me that a series known for being a colorful and wonderful magical RPG with elements of crafting, synthesizing, and exploration has gone into this automated nonsense where the bulk of the game is spent simply assigning tasks as you wait. The entire game to me feels like an mobile application in which you’re better off keeping it in the background until you get that notification about how your construction ability has replenished or a certain item is ready to be sold. Going outside of town isn’t that exciting either, with you assembling your team as they automatically walk from one side of a trail to another as they, again automatically, pick up ingredients with a lazy icon that pops up over a character’s head with whatever it is they’ve picked up. More often than not they’ll say a bunch of nonsense to each other, and as the timer goes down, you’re left deciding if you should run to the end of the exploration you’re on so you can get to a chest or special item at the end, but at the same time risk running into monsters and not picking up ingredients since you can’t do so while running. Battles aren’t much more exciting as it feels like an afterthought, even allowing for an auto-mode as if the game hasn’t already played itself enough. You can only really control your attacking characters as support characters will typically act on their own regardless of how you have your battle system set. 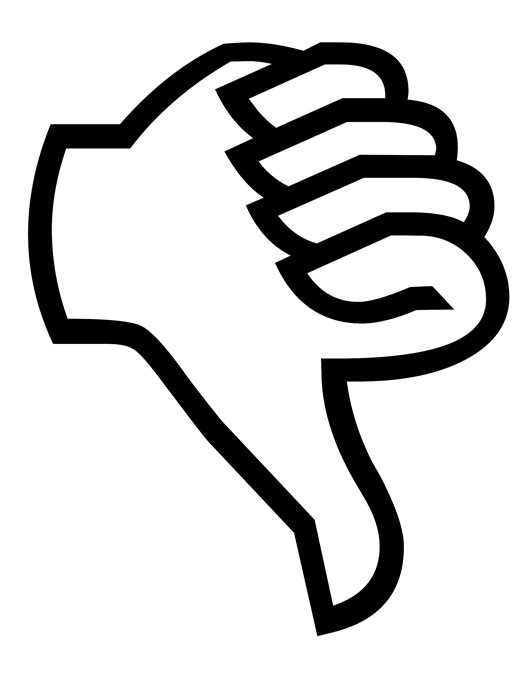 3D renders, when you do see them, aren’t very good, and the performance of the game is very poor. 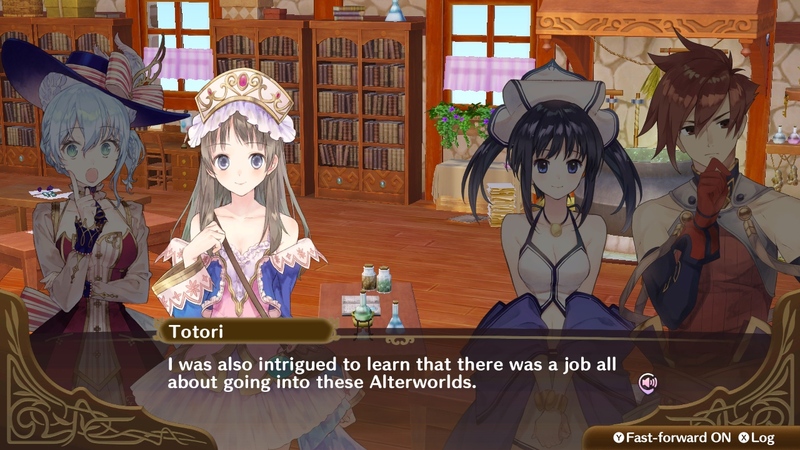 As someone who’s played the more recent entries like Atelier Ayesha, Sophie, Totori, and Escha & Logy on the PS Vita prior, I already knew that when it came to Gust and handhelds it was going to be a rough ride, though some of the hiccups are forgivable. Nelke on the Switch, however, surprised me in the fact that despite being on a significantly more powerful system – a handheld/home console hybrid – it felt and looked no different, and in some cases worse than previous efforts. Shading is virtually nonexistent, animations are choppy and have a freeze-frame effect similar to hit-stops in fighting games, and typos, while not exactly common, were often enough to be noticeable. There’s also this weird thing with the dubbing that not every sentence is voiced over, and it’s always at random moments when it happens. Two characters could be conversing for a solid three minutes fully voiced, and then all of a sudden 30 seconds of quiet as sentences and paragraphs are substituted with grunts or gasps for their audio clips before being fully voiced again a few sentences later. I’d love everyone to enjoy an Atelier game at some point in their lives. For a series that’s been around as long as it has, it never seem like it truly found its footing or following like Final Fantasy, Shin Megami Tensei, Tales of, or the sort, and it’s a shame because they truly are some of my favorites, and while it’s a niche yet dedicated fan base of players that praise Atelier, it feels like Nelke was simply not made with the fans in mind, yet oddly wasn’t trying to make it accessible for newcomers either. Nelke & the Legendary Alchemists is such an odd offshoot meant to celebrate a long-running and beloved RPG series by not celebrating the RPG series. I wanted so bad to enjoy this game, and I truthfully don’t mind the idea of a visual novel Atelier spinoff – something like XBLAZE was to BlazBlue – and I don’t mind farming games or simulators either. Unfortunately, the attempt of whatever you want to call this is so overwhelming yet underwhelming simultaneously that I’m constantly left in a state of disbelief and mental distress. I was hoping I’d get so immersed that I’d believe that Shallie could concoct some Excedrin for me with maybe some valerian root, but instead I’m here in an office of a massive mansion that’s vacant except for Nelke as Misty stands guard, unwilling to lend any rooms to visitors as another form of income, buried deep into chapter three of my Logistics & Supply Chain Management textbook. God bless capitalism. Nelke & the Legendary Alchemists: Ateliers of the New World had the potential to be such an incredible crossover, bringing together over two decades of titles and protagonists that are charming, memorable, and likable. It is instead left feeling more like a cash-in to “celebrate” a milestone with a formula of gameplay and execution that’s bare-bones and more suitable for a mobile audience. The lack of exploration, adventure, and magic leaves the city simulator in disguise a disappointment, and the introductions of all the amazing alchemists I’ve grown to know and love are lackluster and have no real impact. With the way it carries itself, the game acts as more of a background title where you’d wait for a notification telling you you’re able to proceed or you’ve attained certain items or assets than something you’d want to invest hours and hours into like an actual Atelier entry. Even as a city simulator alone, there are much better options out there for a fraction of the price, and the only thing that’s really selling this to anyone is the prospect of an Atelier crossover. Maybe in the future we can get a genuine team up of our favorite alchemists going on a journey in an epic adventure filled with monster slaying and pastries versus watching plants grow. The only thing that’s missing at this point is having the player do their taxes. 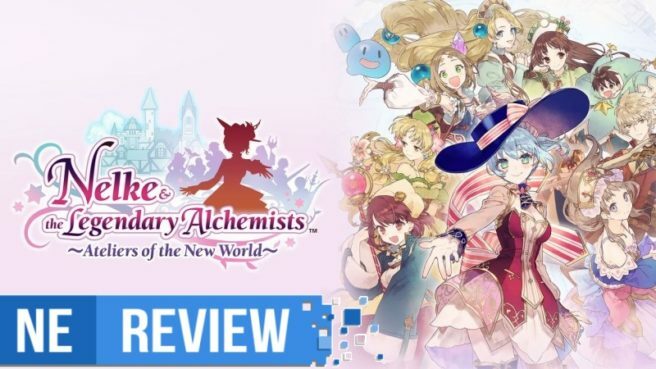 Nelke & the Legendary Alchemists: Ateliers of the New World review copy provided by Koei Tecmo for the purposes of this review.